Your representatives in Montpelier are there to, as the name suggests, represent you in the capitol. Do your representatives’ votes represent how you would vote if you were in their place? 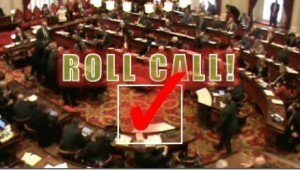 This collection of legislator roll call vote profiles is brought to you as an educational service by the Ethan Allen Institute (EAI). In 2013-14, the Vermont State House of Representatives held over 160 roll call votes on a wide variety of issues. The Senate held over eighty. Some of those votes were for show (of the “who likes puppies?” variety), some were obscure and confusing, some were repetitive (there were several roll call votes on the Gas Tax Increase, for example, and for the sake of simplicity we chose one to feature just one), some were important and illuminating. Opinions will vary on which votes fall into each category. The votes presented here were selected because they are important based on the potential impact the legislation could or will, depending upon final passage, have on the lives of the citizens of Vermont. They are illuminating in the sense that they allow the citizen a clear picture of the direction his or her legislator is driving the state. And, finally, they were chosen because they fall within EAI’s free market, economic oriented mission as they pertain to individual liberty, limited government and the founding principles of our great nation. You link for Bennington county roll call votes is not working. Previous post: Commentary: Does Montpelier Have Its Priorities Straight?